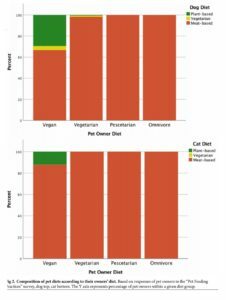 A January 2019 study 1 wanted to investigate whether and how pet owners’ own dietary habits (omnivore, vegetarian, vegan) affect the type of food they choose for their pets (exclusively dogs and cats in this study). The research throws up some interesting and unexpected results. Would you feed plants to dogs and cats? Will plant-based pet food catch on? A questionnaire was sent out to 3,673 pet owners, asking about dietary habits of owner and pet alike. 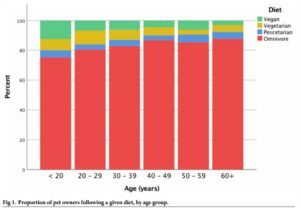 The breakdown of owners by dietary habit and age is shown below. If the pet was fed a mixture of animal & plants it was classed as a vegetarian pet, whilst if fed solely plants, it would be classed as a vegan pet. The findings on what was fed to whose pets were then analysed. The breakdown of pets’ diets according to their owners’ dietary habits is shown below. 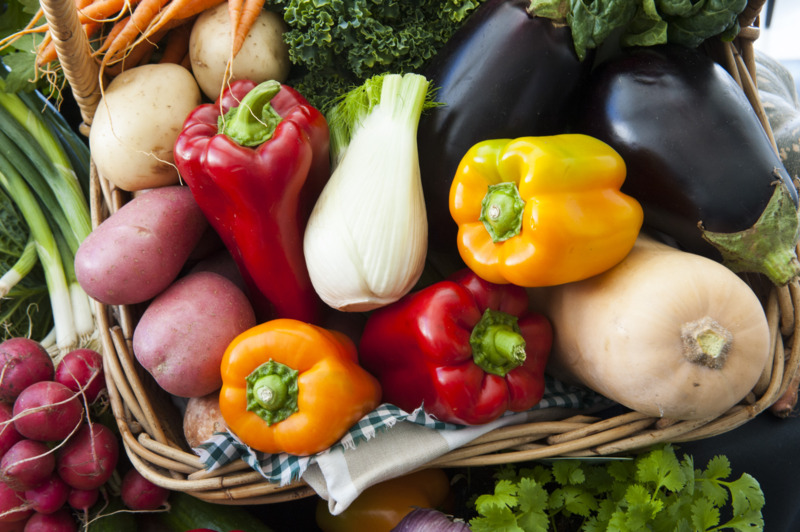 This is a contentious issue for many, since there are strong arguments about the health of dogs and cats fed on plant-based diets. From the plant-eaters’ viewpoint, if you describe yourself as a vegan for moral reasons (i.e. because of strongly-held views on animal welfare), and you have an omnivorous or carnivorous pet (dog or cat, respectively), then you’re going to face at least some moral dilemma when deciding to feed animal products to those pets, since animals still need to be farmed and slaughtered in order to produce the pet food. Additionally, personal distaste in actually handling meat for their pets is likely to be a consideration for those who avoid animal flesh in their own diet. It was only some (1.6% – 59/3,673) vegan pet owners (and one vegetarian dog owner) who fed solely plant-based diets to their pets. A significant number (45% – 269/599) of pet owners who didn’t feed plant-based diets to their pets, but who expressed an interest in doing so, wanted more information about whether or not a plant-based diet would be nutritionally adequate for their pets. 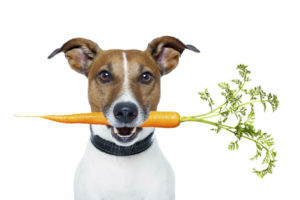 A number of pet owners, who didn’t currently feed plant-based food to their pets, would consider the possibility of feeding such a diet if certain personal criteria were satisfied. The criteria included such things as nutritional appropriateness of the proposed pet food, and cost of commercially-available plant-based pet food (which is really expensive, even when it’s only partly plant-based – see here for an example). The study’s findings suggest that within the general population there are more pet owners interested in feeding their pets plant-based diets than was currently thought to be the case, especially pet owners who already avoid meat in their own diets. Although it must be stated that these individuals would still be within the minority of pet owners, with the majority preferring to continue feeding animal-based diets to their pets. 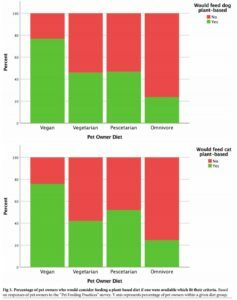 Apart from identifying the number of pet owners who avoided feeding animal products to their pets (there were 229 vegetarians and 212 vegans out of the total 3,673 participants), the study also aimed to identify the concerns that all owners (whether omnivores, vegetarians or vegans) might have when it comes to conventional and plant-based pet food. Interestingly, the most common concern amongst all pet owners in the study who expressed concerns (39% – 1,275/3,231) was the welfare of farm animals . I would have thought that the number of non-vegans/vegetarians concerned about how cows, pigs, chickens etc are reared would have been less than this. So, it’s quite reassuring to know that more of the general population are becoming aware of the plight of farmed animals (albeit that we’re talking here about the pet-owning population – perhaps a more animal-loving subset by the very fact that they decide to share their lives with other species of animal). Regarding those contentious strictly plant-based pet foods, the most common concern (74% – 2,439/3,318) was whether such a diet would be nutritionally complete for their pets. Although commercially-prepared plant-based dog and cat food has been around for some time, it’s been shown 23 4 5 6 that homemade pet diets which provide complete and balanced nutrition are a significant challenge for pet owners to make themselves. 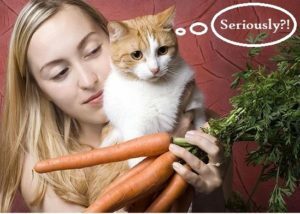 Regarding vegetarian and vegan diets for cats, the problems have been shown 7 to be even more concerning. Consumer demand for plant-based foods in general is increasing, with various companies looking at animal-free pet food alternatives, such as Wild Earth which now produces sustainable “clean protein” for pets – made from a fungus called koji for dogs and lab-grown mouse meat for cats. And since commercial practices are driven in part by consumer demand, where popular consumer belief and not nutritional appropriateness are often the deciding factors, there is likely to be more public discussion about the efficacy of plant-based pet foods in the future. Added to this is the effect of predicted human population growth and the associated increasing demands on the human food system. This will, it’s thought 8 9 , have knock-on effects on the pet food industry which may need to adapt in order to avoid competition with the human food supply. Thus, regardless of pet owner philosophy or diet, prevalence of plant-based pet feeding practices may increase by necessity. An awareness of this may already be seen within the relatively small group of study participants, thus explaining why there is such a surprising high number of omnivore (as well as pesco-vegetarian) pet owners who indicated an interest in feeding their pets a plant-based diet. This study is the first to look at meat-avoidance in pet owners, and its findings reveal that more vegetarians and vegans own pets (dogs and/or cats) than previously expected (12% of the study participants). It’s clear from this study that there’s an association between the diet a pet owner follows and the diet they choose for their pets. With the projected increase in the number of humans choosing plant-based diets for themselves, this contentious issue of plant-based pet food is unlikely to go away.